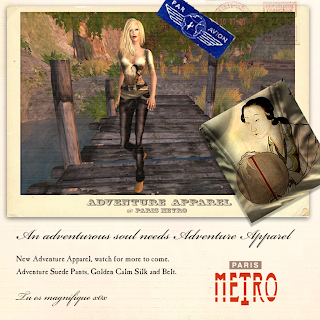 Paris Metro Couture You Are Beautiful: Hunts now are all launched! Hunts now are all launched! It is only in the Paris Store. This great goddess style gown can be worn without wings and halo and be a totally great look for any ballroom occasion. Otherwise, with wings its great dancing on a cloud. Hint: The very highest top floor is where this angel hides. WHAT: 55 L Thursday...Adventure Apparel! Where: Paris France and Grid wide! Hint: Oh dear i dropped my chip on the stairs!!!! Hint: You must get your feet wet to find my heart. The fountain in the center of the store holds something hot in the cool waters. Where: Four Seasons Plaza and Grid wide! Hint: I left a small button on the table up stairs!!!! Hint: Wear your Alex's Santorini Club Tag and its yours!